Daddy longlegs don't pose a threat to humans, but the following species from Laos may unnerve those readers with hair-trigger squeamishness. 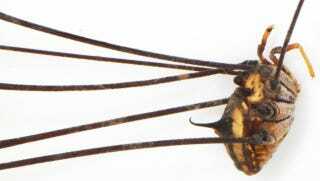 This arachnid — which is known as a harvestman — boasts a 33-centimeter legspan and was discovered in the Laotian province of Khammouan by Dr. Peter Jäger of Frankfurt's Senckenberg Research Institute. It's only slightly smaller than the largest known species of harvestman, which hails from South America and sports a 34-centimeter legspan. It's a shame we can't identify such an exceptional discovery correctly, i.e. its species [...] We haven't dealt with these and related genera from China and neighbouring South East Asia before. Specialists are also unavailable due to the fact that descriptive taxonomy is no longer the main focus of research funding. May the arachnologist community identify this species before this spindly demon develops a taste for human flesh. And for more oversized daddy longlegs, see the harvestmen versus Seattle's Space Needle.